The Rational Capitalist: Time, Universe, etc. We know from the First Law of Thermodynamics that energy can not be created or destroyed. It follows from this law, that everything in the universe has always existed in some form. Yet, I often hear scientific claims related to the "dawn of the universe" or "the beginning of time." Evidently, the universe is believed to be 13.7 billion years old, and, some scientists even hold that discussions of what happened before the big bang are "meaningless" - a non sequitur at best. Related to these claims is the common question of the form "when did the universe begin?" or "what started the universe? ", etc. I have a few thoughts on this. First, "time" is simply a standardized measurement or record of motion. It is a conceptual tool that allows us to define or identify relationships between other forms of motion or between causes and effects. In other words, time is a measurement made by humans, not something existing in the universe per se such as an atom or a rock. If nothing moved (or changed), there would be no time. If there were no humans, time would not "exist" out there. If I walk from point A to B and it takes an hour, this is just the same as saying "during your motion from A to B, the earth spun 1/24 of a revolution." Expressing certain sequences of events in terms of a standard unit of motion is very useful conceptually. But, it is causality which gives us the sense of a direction of time, not time itself. Perhaps, the fact that we are born, age, and then die creates a kind of bias towards the view that the universe must have started at some point or had some ultimate cause, but why does anyone insist on this? The universe doesn't know or care about time or our memories. There can be no "first cause" since everything has always existed. Entities, and therefore causes, can not spring from nothing. Perhaps a better question to ask is: if the universe did "begin" then what was going on before it began, and how is that any easier to grasp and accept than simply following the evidence to the conclusion that everything has always existed? The concept of multiple dimensions and the possibility that they caused the Big Bang presents an approach I find it easier to accept. But once you hit Planck Length, the math gets weird and the world/universe becomes far different. The main philosophic point as I see it is that, ontologically speaking, there has always been something. What that something was, what shape or form it took, with what properties, etc, is a question for science. But philosophically, I can't see how any scientist, no matter how sophisticated, can say that existence as such had a starting point. That makes no epistemological sense. The Big Bang theory does not propose that, as some creationists and Leonard Peikoff hold, that nothing exploded for no reason and created everything. In a nutshell, it states that around 13.7 billion years ago, the universe was very small, very dense and very hot. For some reason, the universe began rapidly expanding - the Big Bang - and as a result, cooling. This has been confirmed with precision tests such as COBE and WMAP, which show that the distribution of background radiation very closely matches what is predicted. 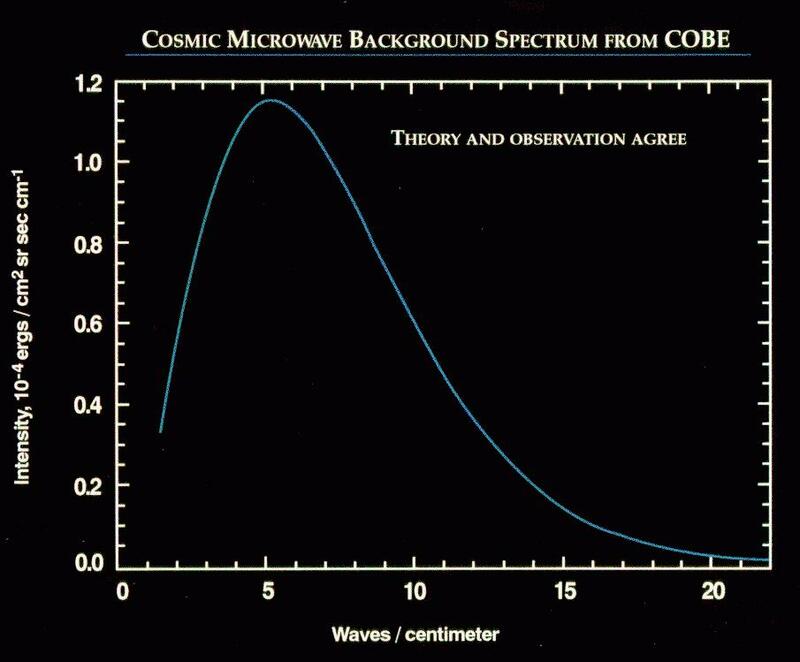 For instance, in this graph the difference between theory and observation is too small to be seen. There are hypotheses as to why the universe began expanding, but it's all very technical and as far as I know uncertain as of yet. Time is not standardized. All frames of reference are equally valid. That is, no matter what coordinates system you use to describe nature the physics should be the same. Galileo realized this and thus the concept of absolute motion was replaced with relative motion. But centuries later, Maxwell's equations (the fundamental laws describing electromagnetism) and the Michelson-Morley experiment showed that the speed of light was absolute and invariant. In 1905 a certain patent clerk realized that Maxwell's equations could not be transformed with Galileo's simple addition of velocities and the physics kept the same. One could however, use something called a Lorentz transformation and everything would work out. Maxwell's equations would be the same, the speed of light would be the same. But distances in time and space would not and that's how special relativity was born. I don't see what you mean with the existence of time being dependent on humans. Do distances in space not exist irregardless of observers? If a star shines and no on is there to see it, does it still emit light? The obvious answer would be yes, but light has a definite frequency! And without time, there can be no frequency. Light is electromagnetic waves. Also, before humans evolved, did radioactivity not exist? If so, you've just invalidated all forms of radiological dating and, not that I want to use guilt by association, you're close to creationist viewpoints. Time is an abstract concept, but concepts, at least valid ones, have a definite relation to something in reality. Just as space is real, so is time, and as far as science is concerned, they have to be treated as one spacetime. First, I said nothing about the Big Bang per se. Evidence points towards a primordial explosion of some kind - fine. I object to the idea that something came out of nothing or the idea that discussion before this point is "meaningless" which is a position apparently held by Hawking. My objection is to the implication that "time began" or the "universe began" with the Big Bang. You said: "Time is not standardized. All frames of reference are equally valid." I think you are confusing my point and making my point for me at the same time. Let me explain. "Time" is a measurement of motion. The fact that all reference frames are equally valid is an expression of this point. I'm claiming that "time" is not an existent but a particular measurement of an existent. Time exists because of cause and effect, i.e., things take place sequentially and we measure this activity in terms of a standard measurement of motion within a given reference frame (a clock calibrated to the earth's motion or atomic decay, etc.). Because the measurement of motion is affected by motion (e.g., length contraction in special relativity), time is necessarily affected. "Time dilation" and "length contraction" are two aspects of the same effect. You said: "I don't see what you mean with the existence of time being dependent on humans. Do distances in space not exist irregardless of observers? If a star shines and no on is there to see it, does it still emit light?" I don't understand how you are inferring from my argument that I deny "distance" or "light", etc. Certainly, frequency is real because certain causes and effects operate faster than others in sequence. I'm just objecting to those that reify time. Motion is the real thing. Time is a measurement of motion. You said: "Time is an abstract concept, but concepts, at least valid ones, have a definite relation to something in reality. Just as space is real, so is time, and as far as science is concerned, they have to be treated as one spacetime." Of course, time is a valid concept. It does relate to something real - the measurement of the motion of existents but time is a concept like "length" in that it is a measurement, not an existent. I'm not sure what you mean by "space is real." If space is empty, it is literally nothing. It's just an absence of something so not sure what you are saying. I understand the mathematical concept of "spacetime" as a measuring tool but I don't see the justification to reify this concept. I think physicists are very sloppy with this stuff, distinguishing measurement from things that exist. note: In my last comment, I should probably replace my use of "existents" with "entities". I think that is more accurate. We seem to agree on the Big Bang. Since nothing can come out of nothing, claims such as "the universe began with the Big Bang" are both erroneous and a misrepresentation of the theory (most common among creationists). As for what happened before, well that's an interesting area of research. Perhaps the universe was in the pre-Bang state for an indefinite amount of time. Or there could be a Bang-Crunch cycle. I guess one could less formally talk about the Bang as "the dawn of the universe as we know it", since the laws of physics we know of break down in the Bang limit. You are right that we only measure differences in time, if that is your point. This is true for many physical quantities, energy, position, even (in a sense) the electromagnetic field. That we only measure differences in position and time (and velocity) is what gives rise to relativity. If I understand your point correctly, you're saying that time is a measurement of a property of motion. I find this hard to conceptualize without ending up in a circular definition. Saying that an object moved from A to B in 1 second would then mean that between the events A and B, there would have been a certain (very large) number of oscillations in a photon emitted in a very specific physical process (that is, simplified, the definition of the second). I find it hard to think about this without thinking of it as the difference in time between A and B being a certain number times the difference in time between two standard events (an oscillation of the photon). This new property of motion seems like an unnecessary increase in concepts. As for time dilation and length contraction you are absolutely correct that they are, in a sense, the same effect. Since relative velocities are supposed to be the same in all frames of reference (a person on a train should perceive the ground moving at the same speed as a person on the ground perceives that the train is moving at) when length is shortened time must increase to compensate. I apologize if I over-interpreted what you wrote: If there were no humans, time would not "exist" out there. Physicists are sometimes sloppy about concepts like vacuum. A physical vacuum should not be understood as absolute nothingness. Physical vacuum is the absence of matter. There are still fields. Light does, strictly speaking, not propagate through nothing. It is a wave in the electromagnetic field. The speed of light in vacuum simply means the speed of light in the absence of matter. As I am sure you know, light moves more slowly in water or glass than in air or vacuum. General relativity suggests that there should be gravitational waves. If light needs a field to propagate through, then it seems to me that gravitational waves would need something similar, a spacetime. And I should add, lest you think I just came here to criticize, that I find your blog excellent -- especially your posts on Obama's pragmatism and philosophical background. I cannot get a grip on the idea of an "expanding universe". Into where would it expand? It cannot expand into nothingness, since nothingness does not exist. I once gave a speculative answer to this: that expansion in this part of the universe corresponds to contraction in another part of the universe. (Of course, I can find no empirical evidence for this speculation, since this contracting part of the universe must be too far away to be yet observed.) But his explanation does not fit with the Big Bang theory. Any ideas? Or am I just making you confused? First, I want to thank you for spurring discussion and helping clarify. Second, I will try and give you my thoughts on your comments later today or tomorrow. Per-olof, same - have a few thoughts on your question too. If an object moves from A to B, there is really no inherent relevance to the relationship of this motion to the motion of some other object such as the motion of the earth (which is standard definition of time). It's certainly important to us for various reasons, but it's not a property of the object per se. Time is just a relation, not an entity, but many seem to reify it as if it "flows" or whatever, and therefore many people seem to insist that "time began" as if the universe was "born" or whatever. I think understanding time as a relation makes it easy to grasp the "eternity" of the universe. "Time is a measurement of motion; as such, it is a type of relationship. Time applies only within the universe, when you define a standard—such as the motion of the earth around the sun. If you take that as a unit, you can say: “This person has a certain relationship to that motion; he has existed for three revolutions; he is three years old.” But when you get to the universe as a whole, obviously no standard is applicable. You cannot get outside the universe. The universe is eternal in the literal sense: non-temporal, out of time." Have any of you read what St. Augustine writes about time in his "Confessions"? He sees the same circularity that Robin wrote about in defining "time" in terms of "motion". Per-Olof, in general relativity something called the stress-energy tensor determines the metric, which defines the distance between points. Under certain circumstances it can be the case that the metric "grows". Even though nothing is moving, the measured distance between objects will increase. I'm sure you're familiar with the balloon analogy: if you mark a balloon in several places and inflate the balloon the distance between marks will increase but not because they are moving. Of course the balloon expands into something, but if you think about it in a Flatland-ish way, where the balloon is the universe, maybe it comes closer to reality. It's hard to formulate an accurate yet intuitive analogy about the entire universe instead of resorting to more abstract mathematics. Any analogy with anything intuitive would be an analogy with something "embedded" (to use a formal mathematical term, the balloon, the surface of which is 2-dimensional in the analogy, is embedded in 3-dimensional space) in the universe. And obviously the universe cannot be embedded within something else. Perhaps you could think of there being a "cosmological ruler" (the metric) used to measure the distance between objects. If the ruler shrinks but the marks on it are left unchanged then measured distances would increase. A distance that was previously measured as 1 ruler-length would perhaps now be measured as 1.5 ruler-lengths. We observe expansion everywhere in the universe on the inter-galactic scale. Within galaxies there is enough matter counteract the expansion, so we don't observe that the distance between the Sun and the Earth is increasing. If you have the time, you could read the chapter in Brian Greene's The Elegant Universe on expansion. Doug, you are right, statements such as "time flows" or "time began" do not make sense to a physicist. An anecdote: two of my friends were having lunch and discussing religion with a classmate of theirs, who said something along the lines of "well, what existed before the universe?" Their synchronous answer was "What do you mean, before the universe!?" Thanks for your answer, Robin, but it does not actually answer my initial objection: how could the universe expand into *nothingness*? If a balloon expands, it expands into the surrounding air. There is "less air and more balloon". But this could hardly be applied to the universe as a whole. If it were applied literally, it would mean there is now "more universe and less nothingness". And this doesn't make sense to me. PS. Another example would be an expanding city. It expands into the countryside, so there is now less countryside than there was before. Should a city for some reason (for example, the collapse of civilization) shrink, there would now be more countryside and less city. But such an example could hardly apply to "the universe as a whole". There could not be more or less of "nothingness". One would have to reify nothingness and turn it into some sort of "somethingness" to make it applicable. Also, I have to object to Robin's "shrinking ruler" example. If a ruler shrinks, while what is measured by the ruler does not shrink, this of course can create an *appearance* or *illusion* that the thing measured has expanded. But the growing distance between the galaxies is not an appearance or illusion, is it? Robin writes: "All frames of reference are equally valid. That is, no matter what coordinates system you use to describe nature the physics should be the same." A couple of years ago I had a long and tedious discussion on this subject on a Swedish discussion forum (and Robin has probably read it). I just couldn't get my point through and finally simply lost patience. It is true that all frames of reference are equally valid - *mathematically*. But they are not equally valid *physically*. Start with the common experience that when you ride on a train, the landscape appears to be rushing by you. But you know full well that it is the train that is moving, not the landscape. Now, you may claim (and Einstein actually does claim) that the two frames of reference here - the train and the landscape - are equally valid. But this is true only in a mathematical sense; the math is the same, no matter which frame of reference you choose. But there is no *physical* cause that makes the landscape move; there *is* a physical cause that makes the train move. This physical cause is simply the locomotive.